Tablecloths can be made in a wide range of materials. Gingham, oilcloth, and flannel backed vinyl are great for casual eating or themed parties. For lightweight tablecloths, try broadcloth or cotton prints. Linen is classic and works for many styles and many events. Burlap is popular for rustic weddings. Sequins, lace, satin, and other dressy materials are perfect for tablecloths and overlays at formal events. The amount of fabric you’ll need for your tablecloth will depend on the table dimensions, how far you want the fabric to hang, and the width of the fabric. See How to Make a Tablecloth for further instructions on sewing your tablecloth. Measure the length and width of the table if it’s square or rectangular. For circular or oval, measure the widest and longest parts of the table. 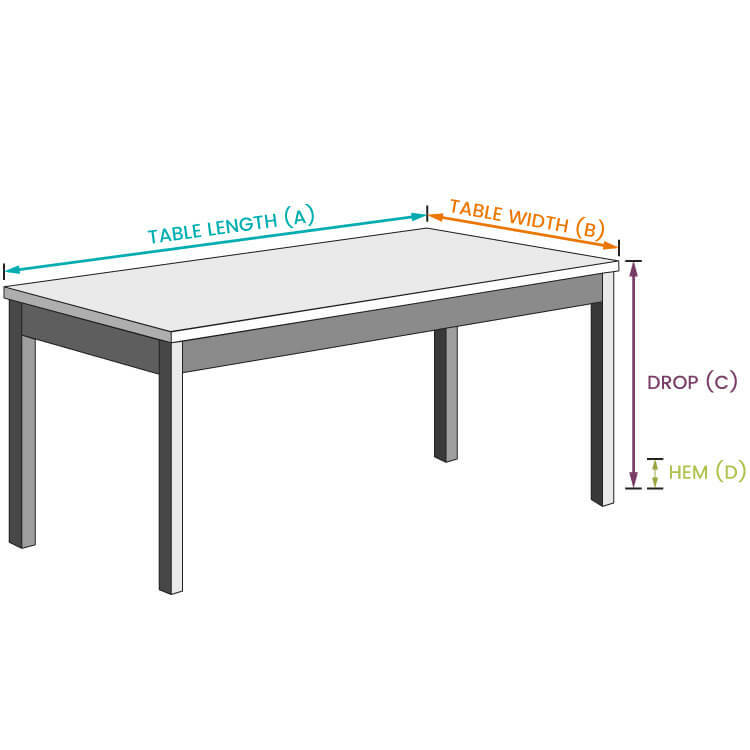 Decide what you want the drop length to be, which is the distance from the edge of the table to where you want the tablecloth to end. Drop lengths are generally from 10 to 12 inches, but may be longer. Mid-length is about 16 to 24 inches and floor length is generally 28 to 30 inches. The short length is good for everyday use, while the longer lengths are nice for more formal looks and special occasions. Also consider how much extra you need for the hem. You will need an inch for a narrow hem about 4 inches if you want a wider hem. Some fabrics, like oilcloth, don’t need to be hemmed. Now that you know what the size of the piece of fabric needs to be, you can figure out how much yardage you need. If the width of the fabric is wider than the width needed for the tablecloth, you just need to get enough yards for the length. But if the fabric isn’t wide enough, you’ll need to sew pieces together. 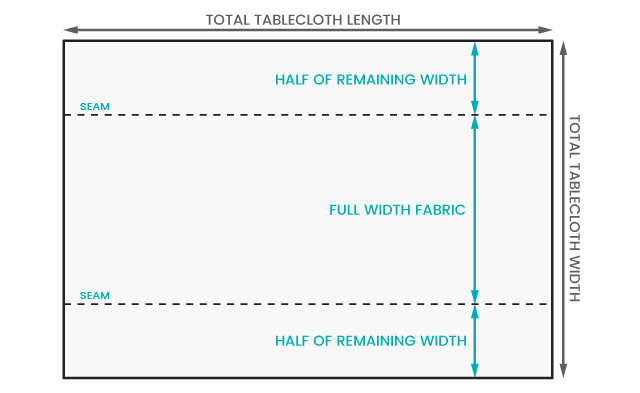 To figure out how many widths of fabric you need, take the total tablecloth width and divide by the width of the fabric. Round up to the next whole number. This is how many widths of fabric you need. Also take into account seam allowances for sewing the widths together. Add an inch for every seam and make sure this still works out. Then take the total tablecloth length and multiply by the number of widths you just calculated. This is the amount of fabric needed in inches. Divide by 36 to convert it to yards. Round up to the next whole number and this is the total yardage you need to get for your tablecloth. If you have a patterned fabric and want to match up the design, add to the total length (in inches) one vertical repeat per every extra width of fabric. (136″ x 2) + 27″ = 299″ / 12 = 24.92 ft / 3 = 8.31 yds, round up to 9 total yards needed. If you plan on washing your tablecloth, always pre-wash because the fabric may shrink. If you want to use a decor fabric that is dry clean only, take a look at this article about washing decor fabric. If you need to sew together 2 pieces of fabric, instead of sewing one seam down the middle, it looks most professional to have the full width piece is the center and sew the remaining needed to both sides of the center piece. To find out how to seam patterned fabric together, look at How To Make a Duvet Cover, because it’s the same way you would do it for tablecloths. That’s it, go buy your fabric! Or take a look at pre-made tablecloths and other event decor. Keep in mind these calculations are only an estimate. It’s a good idea to get a little extra for wiggle room. Click here for further instructions on how to make a tablecloth. How do I figure for 120 round cloth? BEST ANSWER: For round tablecloths, it's the same as a square tablecloth using the circle's diameter as the square's width and length. 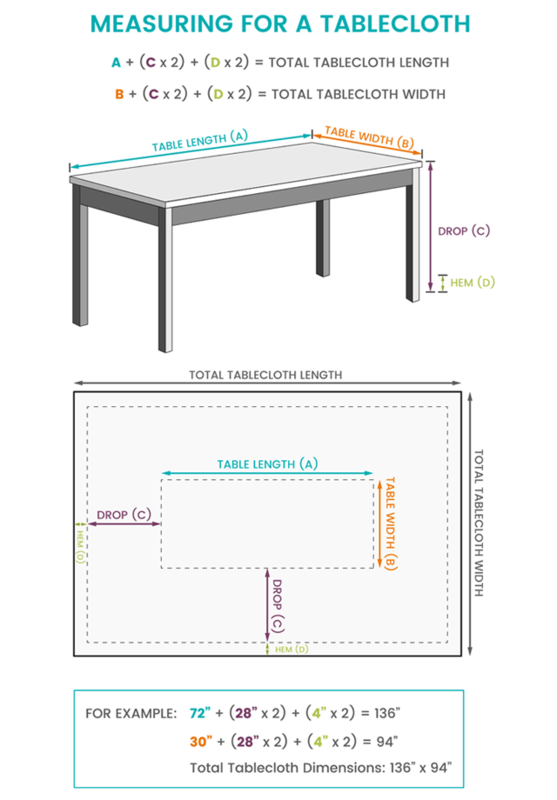 The table length (A) is 120" and the table width (B) is 120". how many yards do I need to made a rectangular tablecloths 30.5x72x32.5? BEST ANSWER: How large the table topper is depends on personal preference but you'd probably want to have it overhang the edges of the table about a foot or more on all sides. I need a square overlay for a 66" round table. How many yards do I need? 30 inch high boy, want the cloth to drape what size do I need?